Have you ever asked yourself ‘What if I am wrong in my beliefs? What if there is no God, no karma, no rebirth, nothing but nothingness when we are done here?‘. I don’t mean like a crisis of faith, but just those fleeting thoughts which linger, unanswered and unanswerable. The truth is, of course, we are all equally in the dark, the believers as well as the non-believers. Very often it is the non-believer’s arguments which seem more rational, more scientific. And even worse, the stories in the newspapers are of atrocities committed by believers, whatever genre their belief may be, rather than the non-believers. In this climate, it is hard not to eye the whole ‘belief’ thing with a certain wariness. This struggle with belief is not new to Hinduism. You may already know of the Nasadiya Sukta नासदीय सूक्त (Hymn of Creation) of the Rigveda. The last two couplets are of particular interest, which I quote below. It is so gloriously open-ended, isn’t it! These verses are about creation but there is something more fundamental, as if even the existence of the Gods and their power over creation is questioned. If even the Vedic seers had such questions in their minds, who will blame us if we do? And yet there it is, my faith. Perhaps it is childhood indoctrination; in fact it almost certainly is that. However it has been such an old friend to me, has shaped my own character and the choices I have made in life so very much that it cannot be separated from me without causing grievous damage to all that I am. I very much identify with this quote by William Sloane Coffin Jr ‘I love the recklessness of faith. First you leap, and then you grow wings‘. It feels as if I leapt in my childhood, even before I knew I was leaping and over the course of my life my faith has grown wings. And like a kite it flies, tethered to anything rational by a mere thread. And that is why I have chosen this beautiful composition by Oothukadu Venkata Subbaiyer today. ‘Whatever anyone says, fear not, O brave heart, keep singing about the compassion of the Lord‘ says he. Why did he write this song, I wonder. What did people say to him that he responded with ‘Even if this world says a thousand things we should keep it aside thinking ‘what is it to do with us?’. The words seem to speak to me when questions cloud my mind. Set to raga Manirangu, it has all the spirit and lyrical beauty of Venkata kavi’s compositions. It makes me smile because he encourages everyone to sing and even dance if they can! Please listen first to Maharajapuram Santhanam’s rendition. It has been a while since I featured him, hasn’t it! I hope you enjoy his simply brilliant voice as much as I do. And the second rendition that caught my fancy today is by Shobana Vignesh. Very nicely sung indeed! Whatever (enna) anyone (yAr) says (sonnAlum), fear not, O heart (anjAdE nenjamE) [Alternative – O brave heart (anjAda nenjamE) ], sing (pADu) about the compassion (karunaiyai) of the Lord (aiyyan). 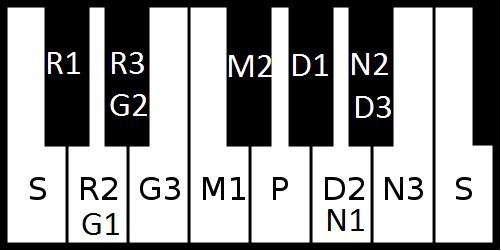 Sing (pADu) with (ODu) elaborations (Alapanai) of the Raga. If you can (muDindAl), also dance (ADu) with (ODu) proper gestures and steps (aDavu). Even if you are given (tandAlum) many (pala) thousands (Ayiram) of precious (arumai) lives (piravigal), will this one come again (implied by varumO=will it come)? Therefore (Adalin)…..
Didn’t (allavO) a man (oruvan), having cut (arindu) the peel (tOlai) and throwing away (dUra eRindu) the fruit (kani), presume to (tuNindu) give (tandAn) only (tani) the peel (tolai) to Him (implied)? [Note: This refers to the episode when Vidura, in the excitement of having Krishna close by, peels bananas and offers the peels to the Lord instead of the fruit. Krishna too consumes it. Vidura on realising what he had done is horrified but Krishna says he would accept anything offered with love.] Further (mElai), didn’t (allavO) a man (oruvan), knowing (terindu) that it was wished for (vENum enDRu), lovingly (virumbi, with liking) give (tandAn) a handful (piDi) of flattened rice (aval) to Him (implied)? [Note: This refers to the tale of Sudama]. Didn’t (allavO) a woman (oruvaL), having lived (irundu, literally been) lifelong (kAlamellam) in austerity, tenderly (kanindu) give (tandAL) a fruit (kani) after biting (kaDittu) and tasting (suvaittu) it? [Note: Refers to Shabari]. Even if this (inda) world (ñAlam) says (sonnAlum) a thousand things (Ayiram) we (nAm) should keep it aside (taLLi, literally push away) thinking ‘what is it to do with us?’ (nammakku edarkku enDru) and repeating (solli solli) His thousand (Ayiram) names (nAmam) sing (pADu) about the compassion (karunaiyai) of the Lord (aiyyan) (pallavi line). Do go now Radha, go immediately! There is no time to think! You do not understand even if told, nor would you think of it by yourself. Don’t trust that Lord! After all, the promises of that illusionist come from the mouth which ate mud! For one who has measured the earth , is it difficult to come to you and make up false stories? Even if Krishna came and told us a thousand things, is it really justified for us to believe it all? In my last post, I talked of Sita, of her refusing to be left behind when Rama goes on exile. Krishna does not go on exile but He does leave Brindavan to complete all that He has to do in His incarnation. And Radha, His sweetheart, His love, is left behind. What happens to Radha? In youthful love, she dances to His tune, both literally and metaphorically. In adulthood, she awaits her Lord for evermore while Krishna marries Rukmini and Satyabhama. Is she seen as the jilted sweetheart? But no! 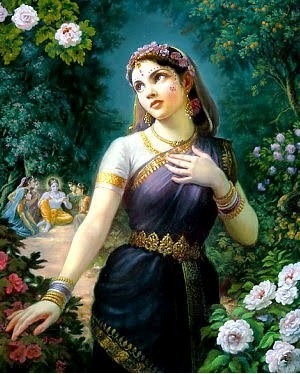 She is His eternal love and has a unique place in the Krishna story. She adorns many a Radha-Krishna temple in a status equal to that of the Lord. ‘Radhe-Krishna’ exclaim millions of Indians; naming Krishna as the one belonging to Radha. Though Radha is sung of in many parts of India, there are hardly any Carnatic songs which feature her. Does the mystic love of Radha and Krishna not really capture the imagination of the more conservative Southerners? Whatever the case, I am pleased to offer for your listening pleasure this gem of a song by Oothukadu Venkata Subbaiyer. I am not sure whether it should be classified as a nindA stuti (backhanded praise of the Lord); it does seem like it should. After all, when normally we are told ‘Trust in God’, the poet says ‘Don’t trust anything He says!’. You can find the lyrics and translation in the footnote. The words are such that we need to look beyond them for a meaningful interpretation. ‘Do go and find him immediately!’. Radha is urged by the poet to go and seek out Krishna. ‘There is no more time to think’, she is told. Who is Radha? She is but the representative of the jIvAtma, the soul which resides in each of us. The song is urging us all to seek Krishna. Krishna is ever busy herding His cattle and paying attention to the crowds who seek Him, says the poet. 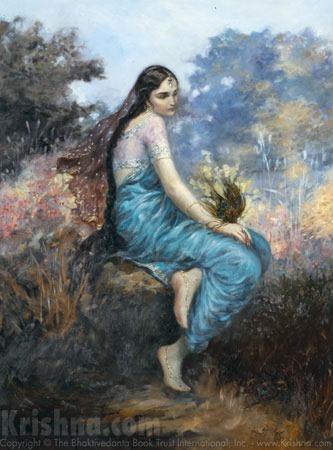 Radha waits forever for her Krishna to come to her. Are we too waiting for the Lord to find us? The poet urges us instead to actively try and find Him. ‘You neither think of seeking Him yourself, nor do you understand when told by others’ says he. A little scolding for us all from the poet! ‘Don’t trust Him’, says the poet to Radha, and us. ‘After all, the promises of that illusionist come from the same mouth which once ate mud!’. 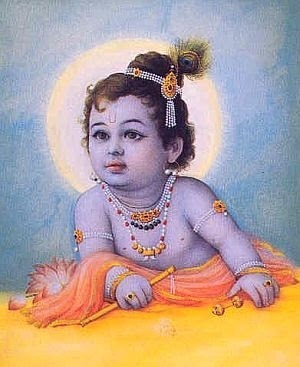 This refers to the story of Krishna as a small child. He is caught eating mud by His mother Yashoda. When questioned, He denies it. She asks Him to open His mouth and sees the whole universe within it. Did He lie? Yes. He did eat mud. No. How can He ingest anything when all the universe is contained within Him? Krishna created illusions – but which was the illusion? That the universe was within His mouth? Or that He was a little child who ate mud? No, He is definitely not to be trusted! ‘For One who has measured the earth, is it difficult to come to you and make up false stories?’. The poet has cleverly used the two meanings of alappadu; this line always makes me smile! Referring to the vAmana avatAra when Lord Vishnu measured the whole world in one single step, the poet says that, in comparison, the task of making up tales is no great thing for the Lord. We have a hint for the interpretation by the poet’s use of mAyan or illusionist for referring to Krishna. The world is but a mAyA, an illusion, a falsehood made up by the Lord. ‘Even if Krishna came and told a thousand things, is it really justified for us to believe it all?’. The Lord encompasses everything, both that which is within the bounds of Maya and that which is outside the bounds of Maya. The poet says that ‘Not all that is contained within the Lord is true’. The Lord tells us a many a tale in this illusion of life that He has created, we should not believe it all! In the last sentence, the poet hopes that the Lord will come to him. ‘If He were only to come alone near our location today, our penances will bear fruit and the result of our sins be gone!’. Here, the poet joins Radha and all of us as a fellow seeker awaiting the Lord’s union. This beautiful song is a Ragamalika in ragas Kalyani, Kambhoji and Vasanta. Given that I love all these ragas, it is no surprise that the song appeals to me so much! I have heard very few renditions of this song. The one I am most familiar with is by the supremely talented Sudha Raghunathan. Another interesting rendition is by T.N.Seshagopalan, to whom you can listen here. Do go (senDRu vA) now Radha, go immediately (inda pOdE)! There is no time (nEralimmai) to think (sindanai seidiDa)! In His concentration (nATTam) of herding (mEykkum) the cows (pasu) and calves (kanDRu), in the crowd (kUTTatile) of cowherds (Ayar) who come (varum) to see (kANa) Him (avarai), He has no time (nEramillai) to stand and talk (ninDRu pEsa) nor is it is appropriate (tOdu) for Him to come Himself (nEril vara). You do not understand (puriyAdE) even if told (sonnAlum), nor would you think of it (tOnDRAdE) by yourself (tannAlum)! Don’t trust (nambAdE) that Lord (mannanai)! After all (implied in dAnE), all (ellAm) the promises (vAkku) of that illusionist (mAyan) come from the mouth (vAy) which ate (tinna) mud(maN). For one who has measured (aLandOrkku) the earth (ulagai), is it difficult (bAramA) to come (vandu) to you (unniDam) and make up a story (poi mUTTi aLappadum)? Even if Krishna (kaNNan) fortunately came (nalam vandu) and told (sonnalum) a thousand things (Ayiram), is it really justified (nyAyamA) for us (nAm) to believe (nambiviDal) it all (adai)? Is everything (ellAm) accepted (koLvadu-koL is normally used as an auxiliary, here it is used as an independent verb which means hold, contain, have) by that divine (tiru) son (magan) of the Lord of the cowherds (Ayar kulattiraivan) Nandagopan become true (uNmayAgumA)? If (enDRAl) he were only to come alone (tanittu vara) near (arugE) our (nam) location (talam) today (inDRu), our penances (tavam) will bear fruit (payan Agume) and the result (payan) of our sins (vinai) be gone (pOgumE)! Come without dancing and swaying, Krishna, as your dance makes all the fourteen worlds sway and tremble! Even Lord Shiva abandons his own dance to come and see you dance! When you dance, all who listen to the anklets jingle on feet are intoxicated. If one of your devotees who come to see your divine dance cast an evil eye on you, my heart will be wounded so please come without dancing and swaying. ‘Beware the evil eye!’ my mother would warn me whenever I talked of any good fortune which came my way. I learnt from childhood to be circumspect with whom I shared good news. This belief in the evil eye is widespread in India. What I discovered with surprise in the course of my life that it is not Indians alone who fear it. This superstition is common amongst many cultures in South and Central Asia, the Mediterranean region, parts of South America as well as parts of Africa. If there is mention of it in Atharvaveda, there is also mention of it in the Old Testament and in the Islamic scriptures. That it is so widespread lends credence to it, don’t you think? Our minds are more powerful than we think, who knows what damage an envious thought can do? Hand-in-hand with this belief in the evil eye are the ways of warding against them. In India you will often see children with black dots painted on their face, houses with odd and ugly sculptures mounted prominently, etc. In my recent very short visit to Turkey, I noticed with surprise the ‘eye’ very prominently displayed everywhere. 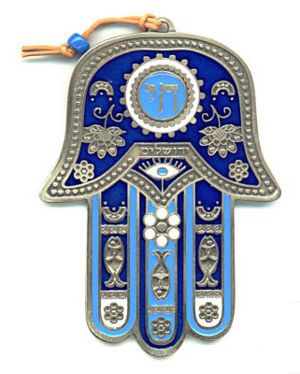 A very long time ago, my Iraqi friend gave me a Hamsa hand, also called the hand of Miriam or the hand of Fatima to hang on my front door. After nearly 20 years, it still hangs there. But can a look of envy affect God himself? Is He in danger of having an evil eye cast on Him? It does seem an odd thought. Isn’t He all powerful? Who could harm Him? Yet one of the most famous prayers recited daily in many Vaishnavaite temples is the couplet written by Periyazhwar in the 6th century to ward of the evil eye for Narayana. O gem-coloured Lord with strong shoulders, who overcame the wrestling Mallas, may the beauty of your divine red feet be protected for countless years, for thousands of countless years, for millions of countless years ! Periyazhwar was not the only one who thought of protecting God from the evil eye. In today’s song, poet-composer Oothukadu Venkata Subbaiyer (1700-1765) sings to his beloved bala Krishna (Krishna as child). ‘Come without dancing and swaying’ he says. 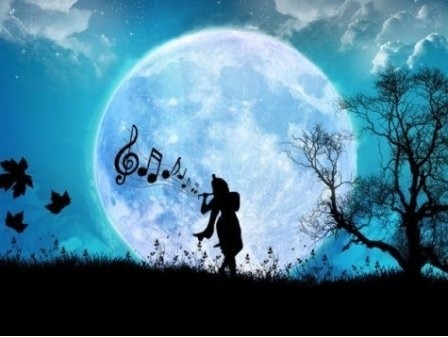 Krishna is so breath-taking when he comes dancing and singing that the whole world stops to watch. Even the great dancing Lord Shiva, whose dance keeps the world revolving, stops his dance to come and watch, says the poet. His description of the dancing Krishna is beguiling. He describes ‘The anklets of the tiny little feet’ which jingle, the ‘plaited hair’ which is all in disarray by the dancing and swaying, the feather stuck in His hair displaced. He is still a beautiful God; ‘Azhaga’ the poet calls Him. Such beauty is in danger of the evil eye, is it not? ‘If an evil eye is cast on you, my heart will be wounded!’ says he. This beautiful song is set to the Raga Madhyamavati. To know more about this raga, click here. For lyrics and translation see footnote. There are many wonderful renditions of this song. I have chosen an interesting rendition of the song by one of my favourite musicians Aruna Sairam. Now answer this quiz : The singer has brought in excerpts from four Oothkadu kritis into her rendition, as a Ragamalika. Which are the four kritis? Answers at the bottom of this post. I meditate upon the joyously dancing Ganapati. He is Spirit incarnate, he is the origin and the foundation, the form of Om, elephant faced, the greatest! He is praised by the joyful chiefs of sages. He lies hidden in the mind of Shiva Shankara. He dwells as the reverberations when celestial musicians endowed with the lute and rhythm strike a note. He is heaven for the wretched. He dwells with beauty in an incomparible divine kalEbara. He dwells in light. He is incomparable. He is fitting. He is honoured by his devotees. Happy Ganesh Chaturthi to all of you! Pillaiyar (His Tamil name) and I share a very amicable relationship. I think of Him as my friend and look often to Him to share the ups and downs of life with me. It wasn’t always so. Brought up in a Vaishnavaite family, He existed only vaguely in my peripheral vision. Naturally, when I married, left India and marked out one corner of my kitchen bench top as the altar of my new home, I did not look for a picture or idol to represent Him. Thus I reached the ripe age of 29 without really integrating Pillaiyar into my life. Then in my 29th year something strange happened. Pillaiyar started invading my home. First it was a friend who came to visit and gave a little pencil holder carved with His form. Then came another friend from India who gave me a small idol which I placed in my altar. A friend from Bombay sent me prasad from a Vinayaka temple and yet another idol. My sister-in-law sent along a wall hanging in Batik, another Pillaiyar. My mother sent a pocket calendar with a picture of Ganesh. Ah, I forgot to say – all this was over just a couple of weeks. Very soon after that I had a psychic experience, an experience which gives me goosebumps even now. Don’t mistake me. I am just an ordinary woman. But very rarely in one’s life extraordinary things can and do happen. And so an extraordinary thing happened to me. After the experience I was left with an unassailable conviction that Pillaiyar had blessed me with a son. As we had not even contemplated having a second child, my husband looked at me with great disbelief when I shared my experience with him that evening. But a visit to the doctor a few weeks later confirmed it, and 40 weeks later I had a beautiful son to nestle in my arms. Now 22 years later, as I look at him sitting across the room engrossed in his book, I remember that day and the wonderful blessing I was given. And on this Pillaiyar Chaturthi day, I once again thank Him for sending me my son. Needless to say, since that day so many years ago, Pillaiyar’s presence abounds in my heart and my home. So what music did I pick for Him today? Those who follow my blog know how much pleasure I take in dancing Gods. And what can be more wonderful that a dancing Pillaiyar? 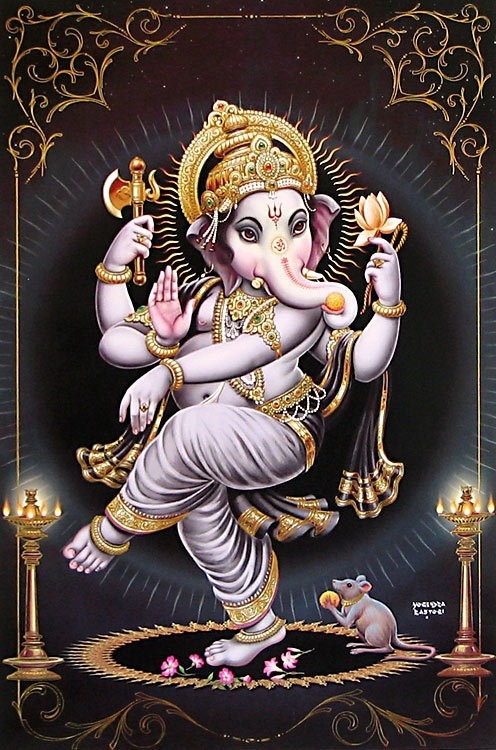 In this wonderfully rhythmic song set to Raga Natta (click here to know a bit more about this raga), Oothukadu Venkata Subbaiyar prays to Vinayaka while he dances his divine dance. For lyrics and translation, see footnote. To present this song, I went for the obvious choice of a dance. In the video below, watch Padmashri and Sangeet Natak Academy winner Dr Ananda Shankar Jayant give meaning to this song with her beautiful Bharatanatyam movements. Click here to listen to an energetic rendition by Aruna Sairam, with slightly different jatis. Note: I have transcribed the jatis as it has been sung for the dance video. It seems as if different musicians add their own jatis as I have heard a few different versions. I meditate (bhavayE) upon the joyously (Ananda) dancing (nartana) Ganapati. He is Spirit incarnate (chidAkara), he is the origin and the foundation (mUla AdhAra), the form of Om (OmkAra), elephant faced (gaja vadana), the greatest (paramam). He is praised (nuta) by the joyful (sAnanda) group (gaNa) of chiefs of sages (munIndra). He lies hidden (nilIyamAnam) in the mind (manasa) of Shiva Shankara. He dwells (mAnam) as the after-song (reverberations?) (anugIta) (note: unsure if anugIya comes from anugIta) when celestial musicians (gandharva) endowed with the lute and rhythm (tantrI laya) strike a note (sAraNa). He is heaven (mandAra) for the wretched (dIna jana). He dwells (mAnam) with beauty (shObhAya) in an incomparible (anupama) divine (divya) kalEbara (body). He dwells (mAnam) in lustre/light (bhAsa). He is incomparable (asamAnam). He is fitting (bhajamAnam). He is honoured (sammAnam) by his devotees (bhakta jana). He is praised (nutam) by the Lord (pati) in Heaven (divi) (meaning Indra I think). His feet (pada) are like the lotus (sarasijam). He resembles (nibham) an emerald (marakata). He has a face (mukham) of an elephant (madakari is an elephant in rut, but here perhaps it just means elephant. Unsure). He is the sound (ninadam) of Om (pranava). He is unsurpassed (ajitam). He is faultless (anagham). He is the giver (-da as suffix) of welfare (shubha). He is the supreme (paramam). He wears (dhAranam) golden (kanaka) clothes (ambara). He has one (Eka) radanam or dantam (tusk). God is in everything. So say Hindu philosophers. तत् त्वं असि – Thou art that, they say with great conviction. Poets have sung of this. सर्वं ब्रह्ममयं – everything is infused by God sang Sadashiva Brahmendra with even more conviction. Kabir has written that God is within each of us. जैसे तिल में तेल है, ज्यूं चकमक में आग , तेरा साईं तुझमे है, तू जाग सके तो जाग – Like there is oil inside the sesame seed, like there is fire within the flint stone, your God is within you, awake if you can wake. So if we look around us, we should see God in all and the great universality of everything in us and us in everything, right? Easier said than done! I often wonder, how did the Saints do it? Is it like looking at the clouds and seeing shapes within? We look at the world around us and look for the shape of God to emerge? It seems doable with nature at times. When I see the beauty of great mountains, the sheer magnitude of the Niagara, the power of a thunderstorm – I can convince myself that I can see the hand of God. It is even feasible to feel at one with inanimate things. I sometimes confront the potato that I am chopping for dinner with a statement such as ‘what you call ‘I’ today, will soon be part of me, my body. You and I are one’. I am even known to declaim to the glass of water before I drink it ‘You were ocean, you were cloud, you were rain, you were other beings, and now you shall be me!’. And no, to those who are curious about the state of my sanity, neither the potato nor the glass of water have replied so far! So the inanimate, that I can do. But to see myself or God in all beings? Even in that idiot who took two parking places to park his tiny car so that I had to go in circles trying to find a spot? Is it possible? How did the Saints do it? So it is with great interest that I pored over Oothukadu Venkata Subbaiyer’s song in which he says he sees Krishna everywhere. He writes ‘Whenever I see anything my thoughts go nowhere except your innocent face’. He provides examples : ‘When sometimes I am drawn to look at the line of the horizon, your tranquil face comes to mind!’ and ‘ Even when I find meaning in the song of a cuckoo, the music of your flute enchants me!’. So if I understand correctly, whatever he does, his mind and thoughts keep being drawn towards Krishna. He is not attesting to the fact that he sees Krishna everywhere, but to the fact that he himself can think of no other than Krishna. Is that the way then? I will let you ponder the question if it interests you. For me, I will just take pleasure in this beautiful song, enjoying the enchanting and evocative images drawn by the poet-composer and marvelling at its foot-tapping brisk melody. Oh how I remember my mother today! She used to sing this song happily to herself while pottering busily in the kitchen. So it is my dearest mother I hear in this song, not the flute of Krishna! Set to raga Nattakurinji, this is a perennial favourite. If you would like to know more about the raga, click here. To present this song, I have chosen a rendition by the great Maharajapuram Santhanam. For an instrumental version, listen to this interesting Veena rendition by R.Jayanthi with a flute interlude as well as solkattu (vocal percussion) in places. Note: I struggled over the translation of some bits and am not myself convinced that I have it right, my apologies. Immersed in the thought of that innocent face, my heart reaches heights of ecstasy! You, who are beautiful with skin the colour of the blue ocean, have taken residence in my heart from that day to this day. Whenever I see anything my thoughts go nowhere except (your innocent face). When sometimes I am drawn to look at the line of the horizon, your tranquil face comes to mind! When my thoughts change at a track of clear still water, your smiling face appears before me! Even when I find meaning in the song of a cuckoo, the music of your flute enchants me! In the fast-moving feet on the head of the snake Kalinga, you still my mind. With the greatest of compassion, please give me the boon that in birth after birth I should melt (for you) with my dreams and memories intact. I am back today with a song about dancing Gods, a recurring theme in this blog. I cannot quite resist the vision of Shiva dancing his Tandava, galaxies shattering and forming again under the force of His stamping feet, energy and mass weaving one into the other, Him both the creator and the created, both the destroyer and the destroyed, dancing His dance to eternity. Nor can I resist the image of Krishna whirling with his gopikas on moonlit nights in deserted groves, animals stilled and watchful, even the wind stilled, heavenly music weaving a magic spell, enchanting everyone, He dancing with all we see, in all we see. One is a vision which leaves us spellbound in awe, the other mesmerises by its charm. So when poets draw me such an image, I am beguiled anew. Our poet-composer today is Oothukadu Venkata Subbaiyer (c.1700-1765) whom I have featured a number of times already. In this joyful song of Krishna’s dance he says ‘After He has played His flute and stolen my heart, how can I have any grievance?’. I love this contentment which is so very unusual in our devotional poetry. We hear poets often wishing and wanting : ‘take care of me’, ‘bless me’, ‘show yourself to me’. Despair and contrition is another running thread : ‘forgive me’, ‘am I not worthy?’, ‘I long for you’ they say. Amongst all this, I much admire this poet who takes joy in Krishna’s dance and says he has no complaints, discontent or grievance. His vision of a dancing Krishna is so beguiling, his notes so joyful that we too can partake in the bliss that the poet has found. Do read the lyrics and translation in the footnote, the poetry is quite charming. Set to Raga Kambhoji, Kuzhaloodi Manamellam is a well known and well loved song. To more about the raga, click here. Today I have gone back to the voices of yesteryears, the Bombay Sisters. The style may feel old-fashioned to today’s ears but the music still sounds impeccable. I had originally chosen Sankaran Namboothiri’s detailed rendition as Kambhoji sounds very good in his rich and powerful voice, but alas, he has taken too many liberties with the lyrics in the second charanam. If you have the time for listening to him anyway, here is a link. I hesitated over the instrumental version. I have heard it said that Kambhoji sounds best on the Nadaswaram, and the rendition which appealed best to me today was on the Veena. But given the title of the song, I present Sikkil Mala Chandrashekharan whose gentle handling of this song is very pleasant to hear. After having stolen (koLLai) all (ellam) my heart (manam) with His flute (kuzhal) playing (oodi, literally blow), what grievance/complaint (kuRai) can I have, my friend?